The pull-up is one of the most popular bodyweight exercises and widely regarded as the perfect complement to the push-up. It’s also one of the premier exercises for upper body strength and development as evident by its use in assessing upper body muscular strength and endurance by various sectors of the world including our armed forces. Unfortunately most people have loathed pull-ups from the time they were asked to perform them as part of the mandatory physical fitness test in high school. It is for this reason many people substitute other pulling exercises like seated rows for pull-ups in their strength training programs. Another reason most people don’t do pull-ups is because of the gravity component. Isaac Newton‘s laws of gravity says in part that whatever goes up must come down. Gravity is that force that attracts or pulls a body towards the earth. This means every time a person does a pull-up, they have to resist gravitational forces trying to pull them down. According to Newton, the mass or object has a direct correlation with gravity. This is why lighter individuals can generally perform more pull-ups than heavier individuals. But that doesn’t mean heavier individuals can’t or shouldn’t perform pull-ups. It’s a matter of mastering the technique and repeated practice sessions. 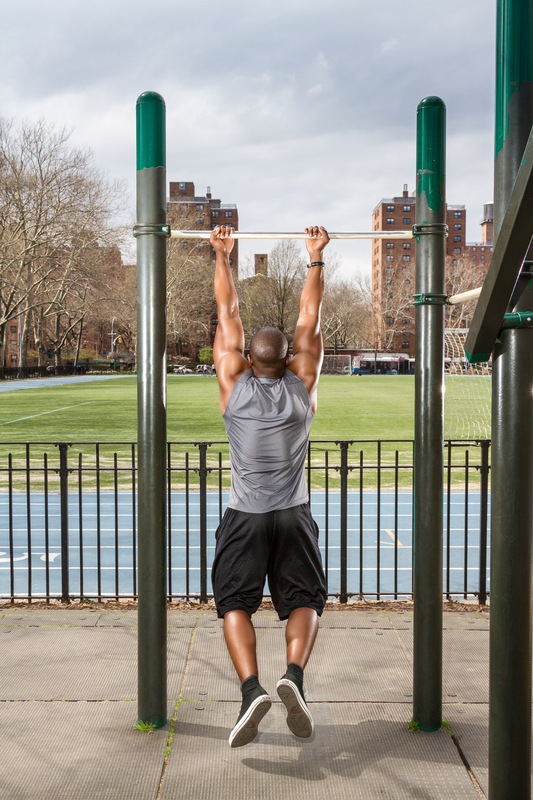 There are several modifications that allow the pull-up to be made possible. But before I get into that, let’s get a basic anatomical and biomechanical understanding of this bodyweight exercise. The pull-up is a multi-joint, closed-chain exercise that requires just a bar for its execution (modern day cable pulley stations now have specially-designed pull-up handles for ease). It is performed with an overhand grip with the latissimus dorsi as the prime mover and the biceps and forearm as secondary small muscles. Because the lats internally rotate the shoulder and humerus, posterior muscles like the teres major and trapezius also get some work. The flexion of the elbow joint at the top causes the contraction of the biceps while the brachioradialis get engaged via extension of the wrist. A standard pull-up requires the body to begin hanging with arms fully extended from an overhead bar or pull-up handle bars. The movement begins with pulling of the body upwards until the chin clears the bar followed by a controlled lowering back to the starting point. Though debatable, I prefer the elbows to remain slightly bent at the bottom so there is constant tension in the muscles being worked. Grip width varies in individuals and is usually determined by the most number of repetitions that can be completed. Although there isn’t a universally accepted grip, the shoulder-width grip or slightly wider is generally utilized. Crossing of the ankles, extension/flexion of the knees and hips don’t necessarily make a difference and are usually based on individual preferences. But ‘kipping’ (generating upward forceful movement of the legs to gain momentum), which was popularized by the CrossFit movement, should be avoided because it devalues the engagement and importance of the upper body work. (I’ll address the controversial training methods of CrossFit in one of my subsequent blogs). Unlike a pull-up which uses a pronated grip, a chin-up uses an underhand (supinated). Both exercises are similar in nature but their names shouldn’t be used interchangeably. The chin-up emphasizes a greater degree of biceps contraction than lat work while the pull-up does the exact opposite: more lat contraction and less biceps work. This is because the elbow flexion line of pull in the chin up is greater than in the pull up due to ‘tucking in’ of the elbows. In other words, if one were pictured at the top of a chin-up, it would look like the top position of a barbell biceps curl. 1. Partner Assistance: This method requires a partner to hold on to the legs, ankles, waist or hips of the person doing the pull-up. By doing so, the exerciser pulls only the torso of the body resulting in less weight. The partner can also provide just enough ‘forced rep’ to help the exerciser get the full ROM. It is important that the partner let the exerciser ‘pull-up’ with as much effort as possible and only assist when a sticking point is reached. 2. Strength Bands: This is becoming one of the more common modifications of the pull-up. It requires the use of strength resistance bands which come in different sizes and tensions. One end of the band is looped over the middle of the pull-up bar while the other end goes over the feet or knees. Although the challenge is greater at the top where the band is slack, the bottom of the pull-up, where most people struggle, is where it’ll be most helpful. It is important to know that the greater the tension of the band, the more assistance it provides. Also multiple limbs (both feet, both knees) on the band require more effort and use less assistance than single limb (one foot, one knee). I utilize strength bands for pull-ups with most of my clients. 3. Assisted Pull-Up Machine: Every commercial gym has at least one assisted pull-up machine. It is ideal for deconditioned individuals and rehabbing patients. Its premise is similar to that of strength bands in terms of assistance from the machine. A decent amount of weight should be selected for a challenging number of reps with good form. The resistance should continually decrease over time until the person is able to perform one or two unassited pull-up. 4. Lat Pulldown: This is best regression of the pull-up. It essentially uses the same exact muscle groups but allows the lower body to take a break. So which is better, the pull-up or lat pulldown? It’s a matter of preference, training goals and comfort level. If your goals are to maintain an optimal level of fitness, either one is fine. However the lat pulldown pales in comparison to the pull-up in terms of greater isometric contraction in the hands leading to enhanced grip strength and forearm development. A 2009 study in the Journal of Strength & Conditioning Research showed the pull-up as having an impact on lean body mass. This comes as no surprise since the pull-up is a staple in strength training and hypertrophy programs. 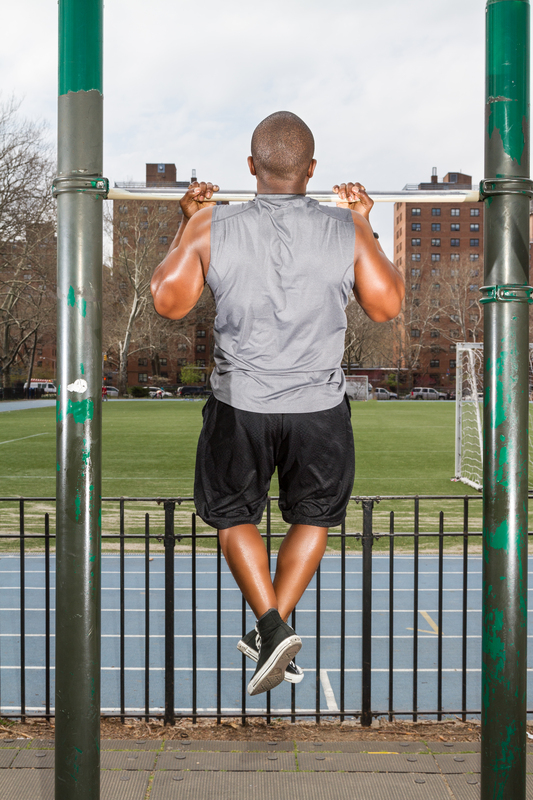 The pull-up has been around for many years and is certainly here to stay. But because of the level of difficulty, many people refrain from doing it often. It is a fantastic exercise for developing upper body strength, improving grip strength, increasing lean body mass and even using various trunk stabilizers to keep the abs engaged. If you’ve never done a pull-up before or can barely do a few unassited reps, try one of the aforementioned modifications the next time you’re at the gym. Your body will adapt over time and soon you’ll find yourself doing unassited pull-ups. If you’re an elite trainee than can do a lot of pull-ups with relative ease, increase the challenge by attaching additional resistance (in the form of weight plates) via a dip belt. Another way to make it challenging is by pulling the chest towards the bar as opposed to just clearing it. This requires more effort thereby making the lats and forearms work a little harder. This entry was posted in Fitness and tagged Bodyweight exercise, Chin-Up, Closed-Chain Exercises, Core Stability, CrossFit, Grip strength, Isaac Newton, Strength Bands. Bookmark the permalink.